Zandvoort beach occupies a strip of about 9 kilometres in length. On busy days the beach is filled with about 10,000 people having fun playing or just soaking up the sun. On the northern side of Zandvoort beach there are several rows of both small and large semi-permanent holiday huts erected. The owners – many of them Amsterdammers – live there for an average of 3 months a year. It is the beach cafés, however, which profit most from the visitors. There is a stretch of at least 38 such pavilions which make up a row covering more than 5 kilometres. These specially built cafés, including at least one year-round café, cater for every possible taste in food, drink and sun bathing requirements. 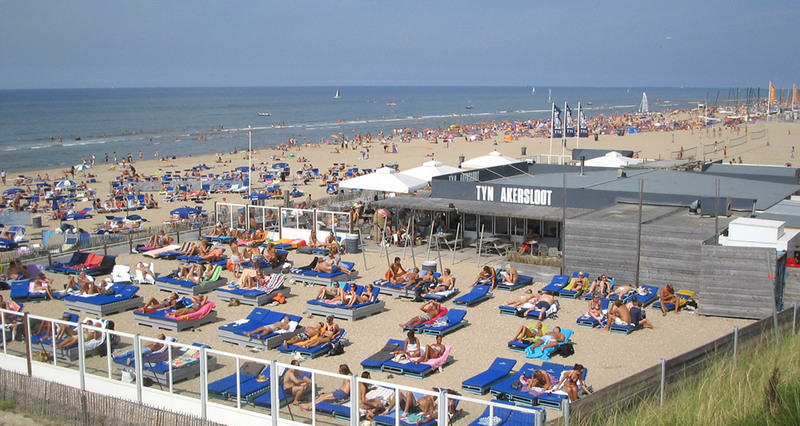 When it comes to beach fun, there are lots of opportunities for recreation on Zandvoort beach. The most popular is sun bathing with people having the choice of throwing down a towel on a soft patch of sand to hiring a sun bed complete with umbrella at one of the many beach cafe terraces. Many of the cafes also offer the chance for a hot or cold shower, the hot being most welcome if it’s a sunny day but with a cool wind coming off the sea! Other choices for recreation on this wonderful stretch of coastline include sailing, kitesurfing, windsurfing, volleyball and there is even an FKK beach for naturists. As far back as 1975 a 2.5 km stretch of sand to the south was set aside to be used as Zandvoort’s naturist beach. This was after a vote the result of which was 9 for and 4 against. This stretch of beach today is around 3 km in length and is located to the south of the main beach. One of the most beautiful sights which you wouldn’t want to miss in Zandvoort after a lovely sunny day is the sunset over the sea. It truly is a magnificent sight to behold. We made a special Zandvoort sunset slide show video complete with music for you to enjoy.